Guava, or Psidium guajava, belongs to the Myrtaceae family and is an evergreen shrub. In Goa, it is called peru, thanks to our Portuguese heritage. 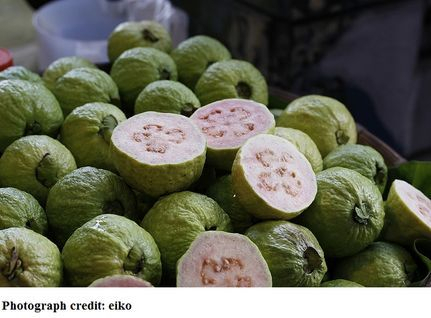 The flesh varies in colour depending on the type of guava. For example apple guavas have pink flesh while lemon guavas have white flesh. The guava tastes sweet and slightly tangy when it is ripe. Depending on the variety, again, the fruit may be round or oblong in shape. They are extremely nutritious and are eaten raw or cooked. They can be made into jam and a dessert called perad (guava cheese). Lycopene in guavas and the oil in the leaves of the tree are beneficial in targeting cancer cells and even preventing certain types of cancer. The dietary fibre present in guavas can prevent a sudden rise in blood sugar levels of patients suffering from type II diabetes. The fruit can help in the case of loose motions and keeps the lining of the intestines healthy. Guavas contain a good quantity of copper which prevents the overproduction of thyroid-stimulating hormone. As a rich source of vitamin C, guavas are better than lemons and oranges in the prevention and treatment of scurvy. This nutritious fruit will not just boost your immunity with its storehouse of vitamins but will also fight against the process of aging because of its antioxidant properties. Retinol in guavas contributes to good eye health. High content of potassium in guavas helps in regulating blood pressure levels. Magnesium in the fruit can have a calming effect on the mind and reduce anxiety. Caution: In cases of serious illness, guavas can act as an aid to the treatment as part of a prescribed diet. It is not a replacement for medication. Ingredients: 500 gm of pomfret, kingfish or kalundar (pearl spot fish), 3 tsp of pepper powder, 1½ tsp of cumin powder, 1 tsp of Kashmiri mirch (chili) powder, ½ tsp of turmeric, 2 large onions (finely chopped), 3 cloves of garlic, 2 green chilies, 2-3 tbsp of coconut vinegar, 3 tbsp of oil, ½ tsp of sugar (optional) and salt to taste. Method: Sauté the onions till they are cooked through and add the finely chopped garlic, green chilies, pepper, turmeric, cumin, Kashmiri chili and cook for 2-3 minutes on a low flame. Add water, vinegar, sugar, and salt and cook for 25 minutes on a low flame. Add the cleaned and cut fish to the curry and cook on high flame for 4-5 minutes till the curry begins to boil. Then turn the flame off and let it sit for another 5 minutes before serving with hot rice. 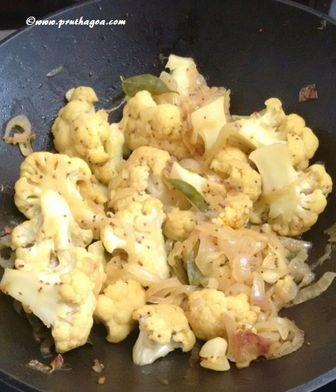 Ingredients: 1 head of cauliflower (about 450 gm of florets), 2 large onions (cut in thin half circles), 4-5 cloves of garlic, ¼ tsp turmeric powder, ½ tsp cumin seeds (whole), ½ tsp mustard seeds, 20-2 curry leaves, 3 green chilies, 2 tbsp oil and salt to taste. Method: Split the mustard seeds in the heated oil. Add cumin seeds, curry leaves and onion. Saute onion till see through and add coarsely chopped garlic, chilies (small slit in the centre of the chilies without exposing the inside), and turmeric powder. Stir for 2 minutes on low flame. Add florets and salt. Mix well and cook for 20 minutes with a 50 ml of water, stirring the mixture intermittently. Stomach ailments: Crush half a teaspoon of ajwain (carom) with half a teaspoon of jeera (cumin) and drink it with ginger infused water for alleviation of stomach issues like indigestion, acidity etc. Asthma: Boil 3 teaspoons of ajwain in 500 ml of water and drink the water with the addition of palm jaggery to aid decongestion and reduce symptoms of asthma.